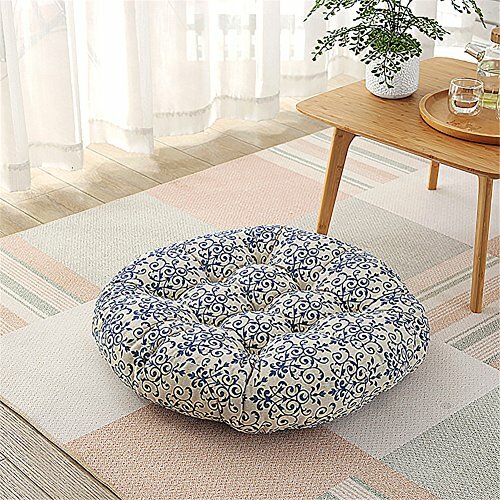 Cushion with soft and comfortable quality surface material, the core is full of high quality PP cotton, fluffy soft, reduce the buttocks pressure, thick texture, warm and comfortable, sedentary without deformation. The surface of the cotton thread sewing positioning, to solve the problem of easy to lose the button. Available in five styles. Size:diameter:23" (60cm), High-quality fabrics, soft and comfortable, healthy and environmentally friendly printing and dyeing, do not fade, no hook silk. Full of high quality PP cotton, fluffy soft, reduce the buttocks pressure, texture thick, warm and comfortable, sedentary without deformation. Round nail design, fixed filling, sedentary deformation, strong and durable, but also solve the problem of easy to lose the button. Multi-functional use, suitable for bedside, seats, sofas, bay windows, tatami and so on. Hand washing and machine wash can be, no bleach, no ironing, anti-exposure. If you have any questions about this product by XIAOAI HOME, contact us by completing and submitting the form below. If you are looking for a specif part number, please include it with your message.